﻿NEW YORK (MARCH 26, 2019) – We’re rapidly moving towards Kids Comic Con (KCC) the annual children’s outreach event. 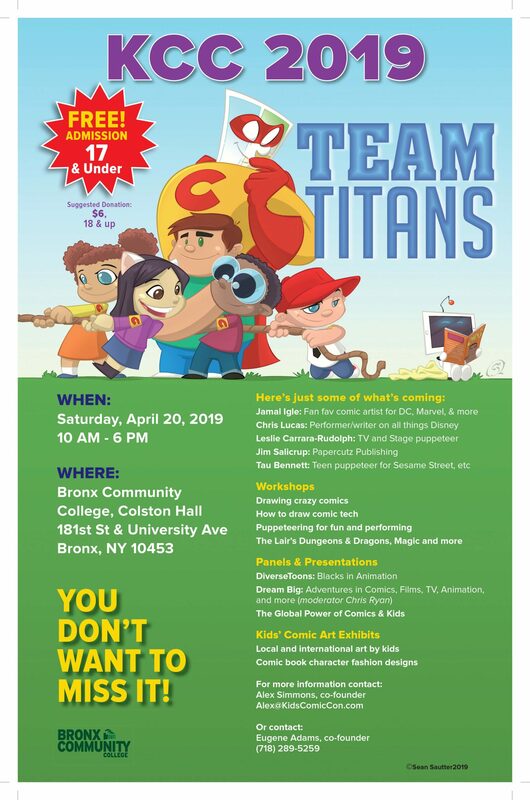 It’s slated for Saturday, April 20th at the Bronx Community College from 10 a.m. to 6 p.m. Our theme is, TEAM Titans! And the team is growing large and strong. •	ThriveCollective, bringing their mural-making-magic to our event, where kids will get to paint the first-ever KCC super-size, superhero mural! •	The Lair: the Bronx’s premiere comics and gaming store! Coming at you with role-playing card game tournaments featuring Yu-Gi-Oh!, Pokemon and Magic, the Gathering. The fun-for-all-ages competition is open to various player levels. The Lair will also have plenty of supplies on hand for KCC attendees to stock up on all their gaming needs. College, 181st Street and University Avenue, Bronx, NY from 10 a.m. to 6 p.m.